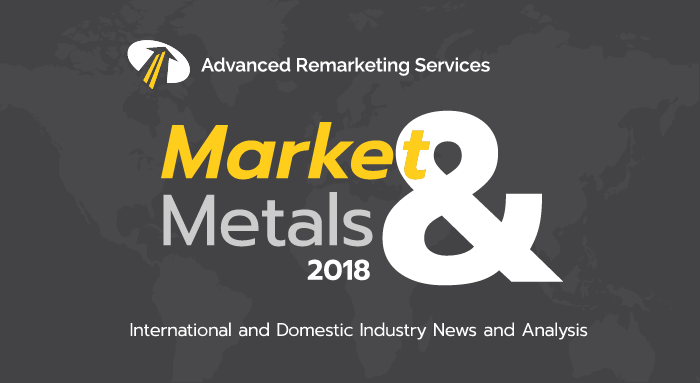 So far in 2018 the scrap metal market is off to a strong start in comparison to average scrap prices of the last few years. Sharp increases continue as we compare to last months report. The national average price of crushed autobodies has increased over 15% from December. It has been a full year since the market has increased this much in a one month period. In January 2017, the market was up over 14% compared to the previous month. After that jump, prices showed strong growth for a couple months before dipping and flattening out to close the year. Compared to the same month last year, the 2018 market is over 19% higher than 2017. As mentioned the average price per ton of crushed autobodies increased about 15%, equating to almost a $27 price increase. This brings the national average price for scrap metal to nearly $197. The market hasn’t increased in value this much since June of 2016 (+$32) when the month closed at over $175. This is also the highest peak in the market since January of 2015 when the price per ton was $202. As we look into each zone around the country we see large increases in zones 3 (southwest), 4 (northeast), and 5 (southeast). Zone 3 showed the most growth and finished tied with zone 5 for the highest national scrap average. That southwest zone which stretches from Louisiana to Arizona increased over 30%. Zones 4 and 5 grew by almost 13% and 24% respectively. The rest of the country even saw substantial increases with over a 5% increase in zone 1 (west coast) and a 6% increase in zone 2 (north-central). Steel tariffs continue to be a political topic of discussion. If this occurs, rising prices in America could be a concern for automakers. We have until mid-April to see if restrictions on steel and aluminum imports will be put into effect. The U.S. Commerce Department presented options that stem from a 1962 trade law to determine whether import restrictions are needed to protect national security. NOTE: All figures are believed to be reliable and represent approximate pricing based on information obtained prior to publication. Data is sourced from American Recycler, London Metal Exchange, iScrap App, and Scrap Monster. Advanced Remarketing Services is not responsible for the accuracy or completeness of the information provided, or for the use or application of information herein.